Whether you use it for call-ins, interviews, ad hoc comments or spots, or whatever you can think of, all you need is a few minutes with it to realize why it has become the universal standard. VoxPro digital audio editing system is the de facto standard for live radio recording, editing and airing of clips in on-air control rooms and newsrooms worldwide. With it, clips can be recorded, edited and On Air in moments. For the user, VoxPro offers advanced features including Auto-Import, Auto-Record, EZ-Export, Automatic Gain Control, networked file access, customizable folders, and our trademark VoiceSlip effect for handling host/caller talk-over. For the engineering staff or system administrator, VoxPro makes networking a snap; its flexibility and versatility allow it to be used in any physical or network configuration. User accounts are managed by means of simple ASCII text files, and user audio files are maintained in a standard Windows format. Fast, reliable, and easy-to-learn, the VoxPro software is most often used with the optional USB control panel. Users may create password protected folders for their own work. Unlimited undo and redo, remote start, and one-button insert record are just a few of VoxPro’s more used features. 10 GB of hard drive storage holds about fifteen hours of stereo files. Using intuitive icons and transport keys, the control panel allows users to speedily record and edit audio. VoxPro digitally records and edits voice, sound effects, and music clips on two tracks. All popular file formats, including MP3, M4A, MP2, WAV, AIFF and WMA files can be imported individually or in groups. Audio can be exported as WAV, MP3s, or native VoxPro files. VoxPro includes a feature that enables talent to simultaneously record audio while editing or playing back other audio. A GapBuster function automatically removes silence from interviews and phone calls. Hotkey and Marker labels can be authored in any of the world’s languages. Color-coded Markers let you work more efficiently, and a detachable Hotkey panel lets you work the way YOU want to. There’s also an option to hide the Editor and File List to reduce on-screen clutter, and greater integration with Wheatstone’s WheatNet-IP audio network, including control for routing, salvos and playback tallies with end warning flash. The ClipCleaner toolset includes spectral display, parametric EQ, de-esser, compressor, expander, limiter and noise gate for processing channels independently or jointly. With a GUI derived from Wheatstone’s LXE digital audio console, the ClipCleaner toolset comes with a standard library of presets for easy setup. 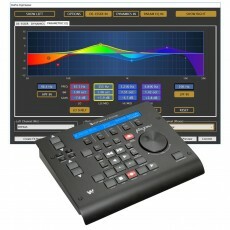 FX Macros are available to create one-button macros for frequently used effects and other editing operations. FX Macros can be used to create a preset for any available effect that can then be assigned to an on-screen button for quick recall. FX Macros can trigger an action or a chain of actions. For example, one click could trigger a chain of actions, starting with the removal of silences from a call-in audio file (using GapBuster), then running the results through ClipCleaner, and finally normalizing both host and caller channel levels for final broadcast. In addition to a new FX Editor, Wheatstone designers also overhauled the VoxPro Effects menu, making special effects like chorus, reverb and distortion much more accessible and making recent effect settings “sticky” for automatic recall. A new onscreen QuickSearch box and the ability to color-code files and hotkeys makes navigation even faster when searching through long file or hotkey lists. Other additions under VoxPro7 include support for importing 24-bit files, a new feature in GapBuster to automatically detect the noise floor, and the use of a hardware-based graphics library for smoother and more efficient performance. VoxPro natively supports WheatNet-IP audio networking for easy access to any source anywhere in the network. “We’ve combined all the intuitive capability that VoxPro is known for with several new features, then we Wheaty-ized it to turn it into an even more powerful tool in the broadcast studio,” says Rick Bidlack, lead engineer for VoxPro. Users may now assign a variety of functions, effects and their own FX Macros to the five hot keys on the VP control panel (the buttons which are normally used to trigger audio Hotkeys). These functions are accessed by pressing the Control, Option and Shift buttons on the controller, in conjunction with the hot key. The existing effects shortcut feature, which utilizes the Control key to display shortcuts for Mute, Bleep and VoiceSlip, is still supported. Users may optionally elect to display any bank of shortcuts permanently, making these functions accessible at all times with a simple press of the corresponding hot key. In order to accommodate file naming conventions imposed by various automation systems, users now have more control over the format of default file names. (The default name is the name which is automatically given to a newly recorded file, like “Untitled_32”, or “Phone67” or “COM0138”.) Any “root” name may be used, and leading zeros may now be specified. Optionally, file names may be numerical only (“0016”). Auto-Import now waits for files to stop growing in size before importing. Auto-imported files may now be automatically gain adjusted or normalized during import. User's headroom display setting (from Settings/Playback) is now incorporated into zoom controls in right margin of waveform editor. The Administrator is now able to rebuild all users' file databases. The Search dialog now stays on top always. It is no longer necessary to install the WNIP PC Driver in order to use WNIP routing commands. It is no longer necessary to install the Sentinel HASP driver if the Keylok dongle is being used. An improved installer allows the HASP driver to be uninstalled if not needed.